*Note* The following review reflects my experience playing the game on a PS4 Pro system. I cannot speak to the quality of visuals or performance of the game running on base PS4 systems or other platforms. – A tremendous amount of multiplayer content. – Specialist abilities change up the competitive multiplayer in a meaningful way. – Satisfying gunplay and movement mechanics. – No campaign means next to no single player activities. – Competitive multiplayer spawn system needs work. – Some loadout/weapon changes don’t amount to much. To point out the obvious thing first, the big deal this year is that Black Ops 4 does not include a Campaign mode. At least, not one in the typical sense. Rather, this time around it’s all about multiplayer, with all breeds of both competitive and cooperative. Whether you’re a lonesome wolf looking for by-the-second thrills in Competitive, a group of rag-tag chuckleheads bouncing around in Blackout, or a tight-knit team of zombie slayers looking for a new fountain of blood to douse yourselves in, Black Ops 4 is in no way lacking in content. That said, the burn of Campaign mode’s omission is still felt, and what we’re left with in its place are a series of vignettes for each of the game’s current roster of ten specialists, which play out in the form of tutorials; not only for the chosen character’s specific abilities, but also for the game’s various Competitive Multiplayer modes. For what they are, these are fun to play through, and offer a number of odd surprises of their own, but the story they offer left me with my hand on my face. Poorly written overall, and in some cases needlessly graphic, they come off as what a middle-school brat likely thinks is gritty and tough. There’s funny bad, and then there’s just bad, and thankfully, if you’ve ever played a multiplayer shooter before, the instruction they offer is largely needless, and this mode can be overlooked entirely. Competitive is what put Call of Duty on the multiplayer gaming map, and this is where the majority of Black Ops 4’s attempts to change up the formula reside. 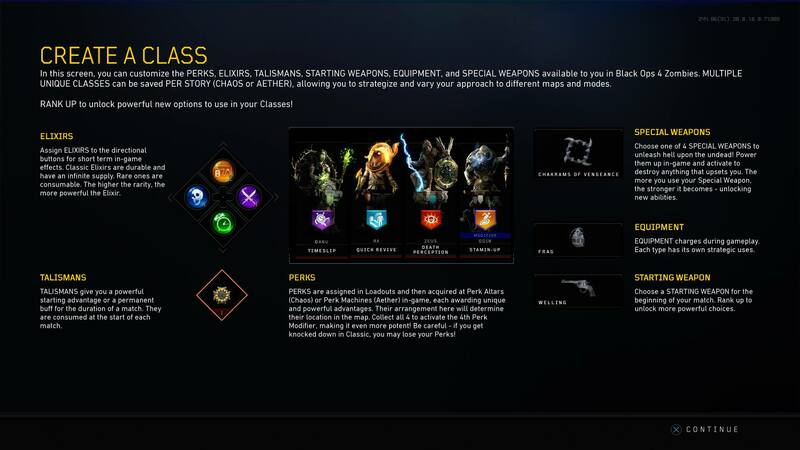 If you’re a fan of the series, you’ll slip right into creating classes and choosing scorestreaks, as the types of weapons found here, as well as the kinds of scorestreak rewards are very similar to previous games, but unlike previous games, specific items which were previously available to use for any sort of class are now tied exclusively to Specialists. The Pick 10 system is back, allowing you to say, toss that secondary and perks away and instead bring along a weapon utterly covered in attachments, or in lieu of bringing a primary weapon along at all, instead opt for a rocket launcher and a handgun. There’s great opportunity for choosing a loadout tailored to your tastes here, even if you often find yourself with points free and nowhere to spend them. Scorestreaks old and new grace each battlefield, ranging from the tried and true UAV to an AI-driven Strike Team, who fan out around the map to gun down your adversaries. Black Ops 4 sets itself apart from previous entries most notably though, in its reworking of the Specialists first seen in Black Ops 3.While this is no Overwatch, the heroes you choose do matter, and the benefits of your team having one Specialist over another can be quite obvious, with Recon’s Sensor Dart displaying any enemy within its circle, or Crash’s Assault Pack supplying huge ammo pools with additional score provided toward scorestreaks with each bullet landed. The traditional Call of Duty experience of fast-paced, left trigger/right trigger running and gunning is in full force here, but Specialists offer a welcome spin on the formula at the same time. Playing Ajax and tossing a 9-Bang grenade over a wall just as a teammate rounds the corner to pick up a couple of easy kills, or unleashing a barrage of War Machine rounds into a Hardpoint as Battery and watching the carnage unfold; Specialists in Black Ops 4 are more front and center than in previous years, and it’s great. There are a couple new modes this year as well, both being round based. In Control, teams take turns attacking and defending a duo of points on the map. All you need to do to capture these points as the attacking team is stand within their perimeter while a segmented circle fills. Each segment acts as a sort of checkpoint, allowing the attacking team a few full wipes without losing all of their progress. Both sides have limited respawns, opening the door to huge swings in the late game as the capture meters fill and available respawns dwindle. Then in Heist, the objective is to capture a briefcase and carry it to an extraction point to win the round. Here however, there are no respawns, nor are there traditional classes. Players spend money earned through dealing damage to enemy players or extracting cash in previous rounds to purchase new weapons and attachments, armor, perks, etc, much akin to Counter Strike. Ammo is at a premium here, and especially during the early rounds, it isn’t uncommon for a scrap to be determined through fisticuffs. Heist is a fun mode, though I feel communication is more necessary than in traditional gametypes. I’m curious how the Search and Destroy community is taking to it, as they haven’t really been thrown a bone since Call of Duty: Ghost’s Reinforce gametype. Competitive Multiplayer is as compelling in Black Ops 4 as it has ever been, even if it isn’t without its blemishes. The respawn system is sporadic at best, as players typically only spawn at one end of the map or the other. This means that quite often, players spawn behind enemy lines at strange times, or if you’re working your way through a section of one end of the map, enemy players can clown car their way over top of you. Weapon spread has changed to be more consistent this year, with each weapon exhibiting its own unique muzzle movements when firing. This is something you notice, but it isn’t something which, on a console gamepad at least, changes the way encounters play out. The other big change has to do with the way the minimap is displayed. Similar to a real time strategy game, the minimap is darkened by a sort of fog of war. Each player has a cone of vision on the minimap, and if an enemy creeps into that cone, even if they aren’t firing their weapon, they are displayed there for the entire team. While at first this makes the minimap more difficult to read at quick glance, once the you feel at home within a map, it can be a tremendous boon to your team’s success, as perhaps someone notices that red pip on the minimap that no one else did, and can deal with it accordingly. Another thing which Black Ops 4 suffers a bit from is multiplayer map design. There are fourteen maps included out of the gate, with four of those being remakes of maps from the past. The number is welcome, and the variety is fine, with the close-ranged chaos of Summit to the huge sightlines of Icebreaker, but many of the new maps adhere to the same sort of ‘big circle with an empty circle in the center’ idea, and while there thankfully isn’t a whole lot of excess verticality in many of these maps, the options for traversal and general flow around them go at odds with this game’s clunky spawn system. While it isn’t uncommon to dislike a few maps here or there in a given Call of Duty entry, there aren’t any maps in Black Ops 4 which I’d consider myself happy to see pop up. They serve their purpose well enough, but they leave something to be desired. When it comes down to it though, the moment to moment action found in Black Ops 4’s Competitive Multiplayer offering is hard not to appreciate. Time will tell what will be done for better or worse with random loot boxes and dlc once the time comes. Feeling artistic? 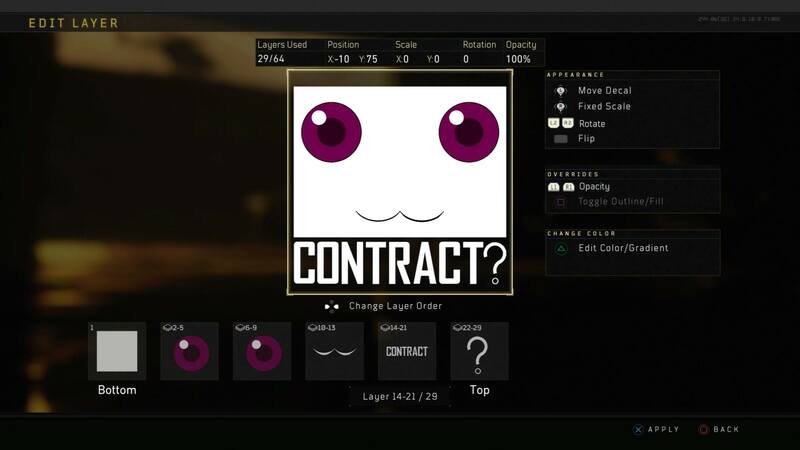 The Emblem Editor lets you group layers and use simple shapes to create a player icon that speaks to you. While there is no avoiding that Blackout mode bears uncanny similarities to the other battle royale heavy hitters out there, the tight weapon handling, snappy movement mechanics and wide array of available firearms and perks make Black Ops 4’s rendition at least play differently, even if at a stray glance, the visuals and general gameplay flow may leave viewers confusing the game on the screen with PUBG. Depending on the mode, 88 to 100 players are dropped into Blackout mode’s single map via a series of helicopters, and while yes, only having the one map is a bit underwhelming, it is at the very least quite varied. This is a huge space, and unless you happen across one of the mode’s numerous transportation options, including a (smaller, player driven) helicopter, motorboat among others, a significant portion of your time each match may be spent trucking it on foot from one contested area to the next in your attempt to stay within the ever-shrinking confines of the wall, and stay alive while contending with the plethora of angry people out there who mean you harm. Keenly-eyed fans of the series will recognize small portions of the map as areas which were previously stand-alone competitive multiplayer maps in years past, with fan-favorite Nuketown being part of an island in the southwestern corner of the map, and sections of Turbine, Raid, Stronghold among others dotted about the hilly, sun-drenched landscape. The map is varied nicely, with structures large and small here, wide open expanses there, and due to the unpredictability of the shrinking of the wall, your path through it will change wildly from match to match. For this series, it’s all about breakneck action. Speed and precision are the hallmarks, most notably in recent entries. By that regard, Blackout mode is a tremendous change of pace. A significant majority of firefights will end within a second or two, much like in traditional competitive multiplayer, but the massiveness of the map and the unpredictability of the randomly distributed weapons, perks and healing items means that careful consideration of inventory is necessary before you charge into a given conflict. Having one life per match means that self-preservation is key, and the question of whether or not you should try to engage that player you see in the distance or maybe let fate sort them out instead offers a tension never before seen in Call of Duty multiplayer. With the Call of Duty series, performance has become a staple, and while Blackout’s map exhibits its share of samey looking, rather bland buildings spread across its sprawl, and its foliage doesn’t look particularly detailed when lying prone in the grass preparing to pounce on some unsuspecting player, the frame rate is of no issue, and while any network instability comes with the territory, rarely does a match play out with any glaring issue. Black Ops 4 is what the developers claim to be the perfect hopping on point for Zombie newcomers, as not only does this game provide a new crew of characters and a new storyline for the four of them to uncover, but it also brings back the original group, and a new scenario for them as well. While the cryptic nature of this mode is largely in full force yet again, which if you’re anything like me, isn’t especially appealing, efforts were at least made to give players at least a small hint as to how to progress through the given scenario and to ultimately see our group of heroes to safety(?). Some doors are opened by traditional means, requiring a grip of Points which are accrued by dealing damage to the evil creatures seeking to end you, but others may demand further exploration, or the collection of objects in the environment or dropped by tougher foes. Zombies has its own fully fleshed out progression system, with loadouts rivaling Competitive Multiplayer in their complexity. If you’re more interested in the narrative, or just want to get a better feel for where the various firearms and items are in a given scenario, Zombies includes a Custom Games option, where you can adjust difficulty at your leisure. And for those less interested in working through a collection of rather obtuse objectives to decipher an obfuscated narrative in the classic style of Zombies, Black Ops 4 also contains an alternative mode, Rush. Here, the weapons and perks adorning the walls of the chosen scenario are free for the taking, but zombies and other dark creatures relentlessly pound your team of heroes. As time and corpses accrue, new sections of the level are revealed, and as players work their way through, competing for the highest score all the while, they might be tasked with defending specific areas from the horde. This is a hectic, fast paced mode in comparison to the classic Zombies experience, and a welcome inclusion for players who enjoy loudly wading through a hive of angry enemies without the need to strategize with friends, or worry about collecting artifacts to continue their progress. 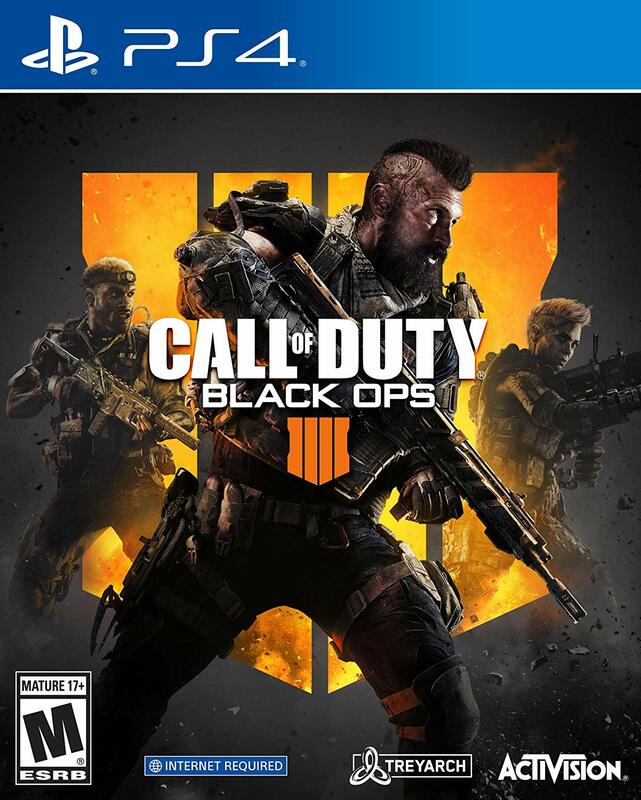 Call of Duty: Black Ops 4 is a game designed by a team who understands not only the legacy of the series, but also has an eye to the desires of the always fickle, always moving modern video game playerbase. While last year’s Call of Duty: WWII took the brute force approach, and attempted to provide a more traditional experience with modern trappings, what Treyarch has done with Black Ops 4 is listen to what people are looking for while respecting the history of the series at the same time, providing a slightly more class-based competitive multiplayer, a massive amount of cooperative zombies content, as well as introducing its own take on battle royale, which has become a fan favorite mode over the past year. What we’re left with is a game which isn’t without its rough edges, but provides just enough refinement, and just enough change to avoid feeling stale. It feels recognizable yet fresh, which at this point, after over a decade of Call of Duty games without a year missed, is perhaps the best a fan of the series might ask for.